GOSHEN, Ind. 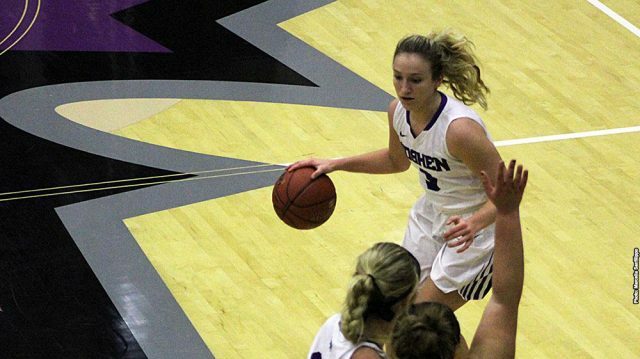 — The Goshen College Women’s basketball team suffered a loss at the hands of NAIA Division II 22nd-ranked Taylor University 84-40 on Saturday afternoon in a Crossroads league matchup at Gunden Gymnasium. The entire roster scored at least once on the afternoon led by Mariah Roe, a first-year, and Donnae Lipinski, a sophomore, with seven and six respectively. Logan Kyre paced the Leafs with a career and team-high six rebounds in just 10 minutes of action. Both teams started the game slowly before Taylor’s Kendall Bradbury scored the first of her 22 points with 8:20 remaining in the first quarter, sparking a 15-2 Taylor run. Goshen did their best to counter the Trojan attack with a run of their own to end the second frame. Keyaira Murff, a first-year, commenced the 7-0 spurt before Taylor scored a bucket and free throw to end the quarter up 18-9. Taylor once again found themselves on a scoring frenzy to begin the second stanza on a 12-0 run broken by a Roe bucket with 6:07 left in the first half. Taylor scored the next 10 points before a Claire Rauck, a first-year, 3-pointer closed the first half with the Trojans firmly planted in the driver’s seat at 40-14. The third quarter proved much of the same, as both teams traded points before Taylor went on a 22-9 run to end the third quarter, led by a 100 percent (11-11) from the free throw line to push the lead to 70-26 in favor of the Trojans. Goshen saved its best quarter for last as both teams shot an exact 36 percent (5-for-14) from the field and 50 percent (2-for-4) from the free throw line. Taylor narrowly outscored the hosting Leafs 14-13 in the 10 minutes of play. It was Goshen’s closest quarter margin on the afternoon. The Leafs ended the affair just 28 percent (15-for-54) from the field and a meager 11 percent (3-for-27) clip from beyond the arc. Taylor, on the other hand, was hot from start to finish as they poured in bucket after bucket at a 48 percent (28-for-58) rate overall and from the 3-point line (11-for-23). With this loss, the Goshen women fall to 1-19 in the season and 0-8 in the Crossroads League, while Taylor improves to 13-7 and 6-2 respectively. The Leafs remain at the bottom of the barrel in conference play at 10th, while Taylor remains atop the pecking order, tied at second with Indiana Wesleyan and Mount Vernon Nazarene University. Following a road matchup at Huntington University on Tuesday (completed after print deadline), the GC women will travel to take on number-five nationally-ranked and top CL foe Marian University this Saturday. Tip-off for the contest is set for 1 p.m.